I came across this today and ,I have to say, for someone who released a film through Paramount who , by default, protect their IP and advertise films heavily its a bit rich. I tell you what Banksy can I have your film and do WHATEVER I want with it? I mean I saw adverts for your film everywhere. They annoyed me as I didn’t ask to see them. Now I have been to Eygpt and it was VERY friendly and fun. However, I am pretty sure this is what most people think of when they think of Egypt at the moment. THIS DOESNT LOOK VERY RELAXED DOES IT? Yet advertising is addicted to talking to us like idiots. Everything is fine in Egypt – Ignore the news – I am a poster – LISTEN TO MY ROAR. My point is that the days of lying or selling an image are diminishing. Be honest, open and remember that posters are , generally pretty lame. So are dictators too. I know. POLITICAL. 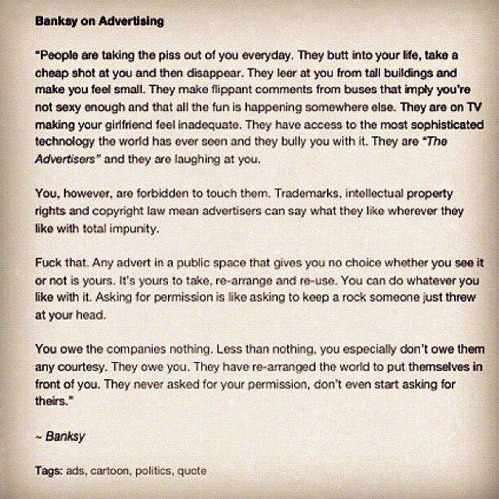 Oh and Banksy your art should do the talking. ← Why do YouTube videos go viral?